Curriculum Content provides academic language that can be aligned to the learners' curriculum of study. Phonics provides study of letters and sounds and high-frequency words. How can the Learning Village help me? What does the Learning Village do? The Learning Village offers EAL blended learning for learners in schools (for induction to English, gap filling and pre-teaching vocabulary and language structures) both for independent learning and small group teaching. Suitable for learners of any language due to it's image-based methodology, including those not literate in their home language. What is the impact of using the Learning Village? Longer term research has commenced in Lea Forest Academy, Birmingham and Wood End Academy, London. 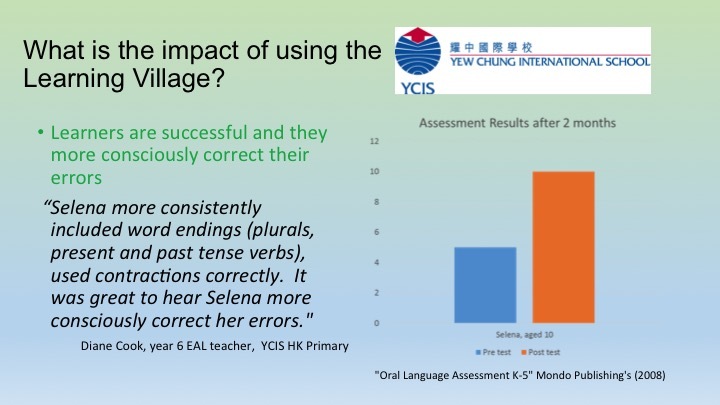 Testing showed significant results: https://www.learningvillage.net/reviews. You can find a document containing several case studies and testimonials demonstrating the impact of the Learning Village by clicking here. You can find a case study of the impact of the Learning Village in Tudor Primary in London, UK, by clicking here. Download a PDF for student 'Ali' here (right-click then 'Save as'). What methodology does the Learning Village use? 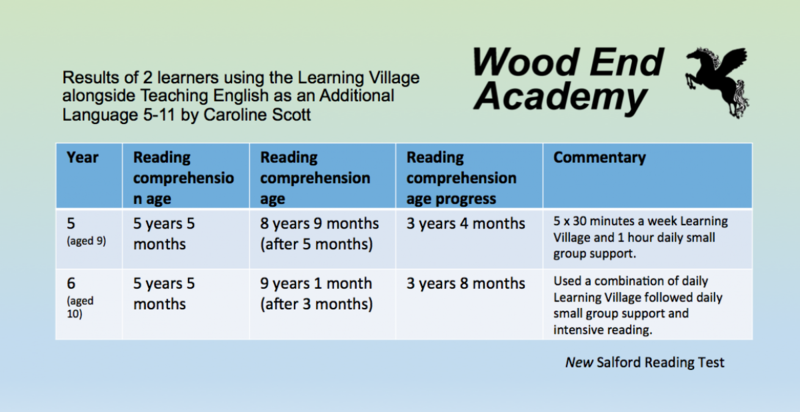 The Learning Village is built on tested methods of learning and developed from Teaching English as an Additional Language 5-11 (2012) by Caroline Scott, Director. It is based on a form-focus approach to learning vocabulary and language structures (through strategic use of flashcards online and offline) and is designed to be used in collaboration with communicative approach (immersion in the mainstream). There is a very large number of studies showing the effectiveness of such learning in terms of amount and speed of learning. See Nation (1982), Paivio and Desrochers (1981) and Pressley et al (1982) for a review of these studies. Research on learning from context shows that such learning does occur, but that it requires learners to engage in large amounts of reading and listening because the learning is small and cumulative (Nagy, Herman, and Anderson 1985; Nagy, (1997). This should not be seen as an argument that learning from context is not worthwhile. It is by far the most important vocabulary-learning programme. For fast vocabulary expansion, however, it is not sufficient by itself. There is no research that shows that learning from context provides better results than learning from word cards (Nation, 1982). Research on the learning of grammar shows that form focussed instruction is a valuable component of a language learning course (Ellis, 1990 Long, 1988). Courses with a form-focuses component achieve better results than courses without such a component. The important issue is to achieve a balance between meaning-focussed activities, form-focussed activities, and fluency development activities (Nation, 1997). Direct learning of vocabulary from cards is a kind of form focussed instruction which can have the same benefits, perhaps even more markedly so, than form focussed grammar instruction. Further methodology is published in 'An Engish as an Additional Language Programme: Learning through images for 7-12 year olds.' which will be released this year. How does the Learning Village work? The learning of new vocabulary and language structures is taught through speaking, listening, reading and writing. It is delivered through pictures, making learning accessible to students of any mother tongue. Teachers enroll their students, and can then monitor usage, view progress, assign curriculum content (lessons in all areas of the curriculum are available e.g. weather in Geography, Ancient Egypt in History, measurements in Maths and Sound in Science), request content and send messages to their students among other features. There are over 8000 words/phrases that have been designed to be aligned to the National Curriculum, the International Primary Curriculum, Cornerstones Curriculum, International Baccalaureate PYP and any other curricula. Flashcards come with every lesson as well as games to support usage. 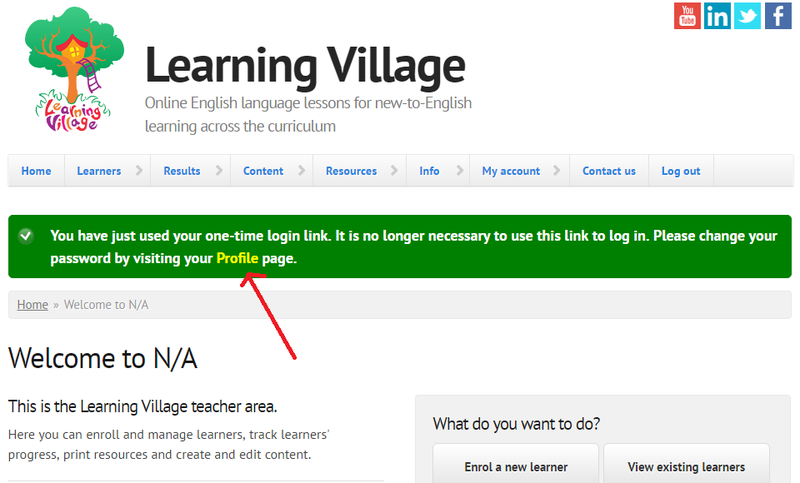 The Learning Village is designed to allow students to take ownership over their language-learning journey with a private website login. At the heart of the student experience is the Learning Village map, which closely mimics the student’s move to a new town. A tree-house, the student’s private quarters within the map, displays the aforementioned three strands of learning and provides a journey-like experience for each. As students progress through their strand-journeys, friends are made and populate their map. Friends can be visited at any time and facilitate the writing and speaking elements of the learning journeys. They also support the student with motivational messages. Which learners should use the Learning Village? How does it align to my curriculum? This information will be useful to anyone using the Learning Village in collaboration with other assessments e.g frameworks such as Common European Framework (CEFR), NASSEA, Language in Common and the new English National Curriculum Proficiency in English or tests such as the New Salford Reading Test or old QCA National curriculum level tests. *Note that a reading age may be over 7 years old but vocabulary and language structures may not be secure. If you believe this to be the case, assess learners on the content of the sessions using the hide button on the ‘learn pages’ of the demo learner. You can then note down your findings using the assessment for learning grid for tracking survival language (found in your toolbox). **Phonics is based on Letters & Sounds (Department for Education & Skills), high frequency words (New General Service List) and New National Curriculum. The Learning Village has been developed based on the needs of teachers in schools in the UK and internationally. Lessons are developed from the New English National Curriculum, the International Primary Curriculum, International Baccalaureate and other curricula. All online lessons come wth flashcards to that can be used offline. It's also fully customised to suit your learner! How much would it cost a member of staff to provide this much tuition? An EAL support programme, demo student for whole group teaching, monitoring of progress reports and flashcards to support every lesson. I am a school applying for refugee sanctuary status. How can you help me? Communication Across Cultures partners with EntraideUK. EntraideUK is a small charity based in the North of Solihull. Their aims are to support asylum seekers, refugees and migrant workers living in Solihull and the surrounding area in order to facilitate their integration into society. We have provided them and their partner school with training and free subscriptions and teacher training to support their new-to-English refugee learners. The Learning Village is resource developed by Across Cultures. We provide teachers and parents with the skills and resources needed to successfully support their young English language learners within the demands of the curriculum. 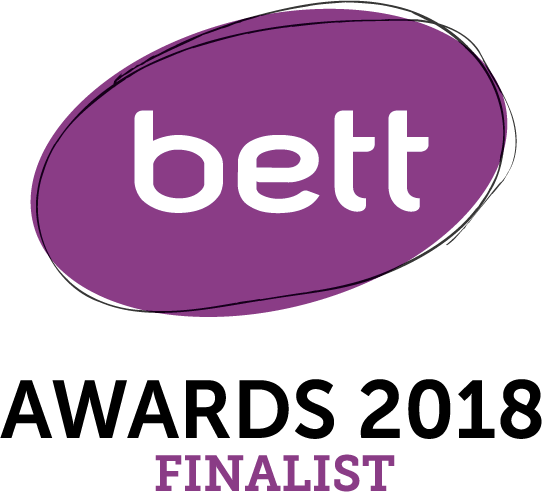 Caroline Scott BA, DipM, NPQH, MA has been working in schools developing English language skills for young learners catering for beginner through to fluent learners in culturally rich, international minded learning environments. She has taught young learners and trained teachers in the Europe, South East Asia and the Middle East. Caroline was the founding Head of Primary at CES, A British International school in Cairo, Egypt (3-18 IPC school) and the Primary Principal at the International School of Milan, Italy (3-18 IB PYP school). As well a delivering training across the UK and overseas, Caroline also links to a school in London where she continues to work with teachers and learners. 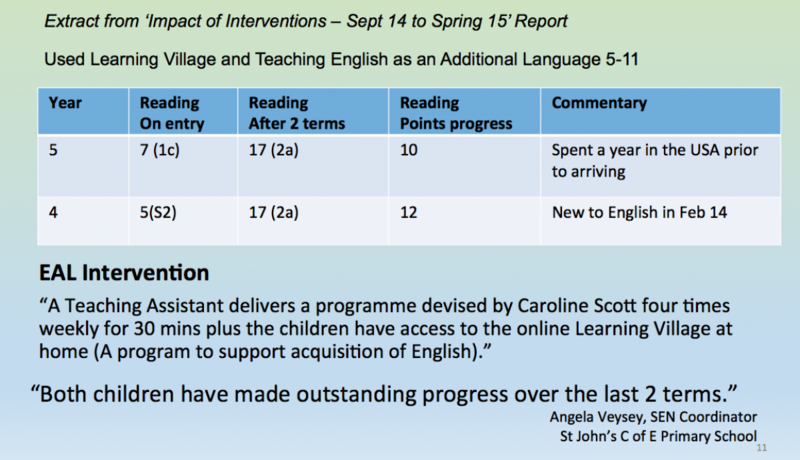 Caroline is the author of 'Teaching Children English as an Additional Language: A programme for 7-11 year olds' and 'Teaching English as an Additional Language 5-11: A Whole School Resource'. 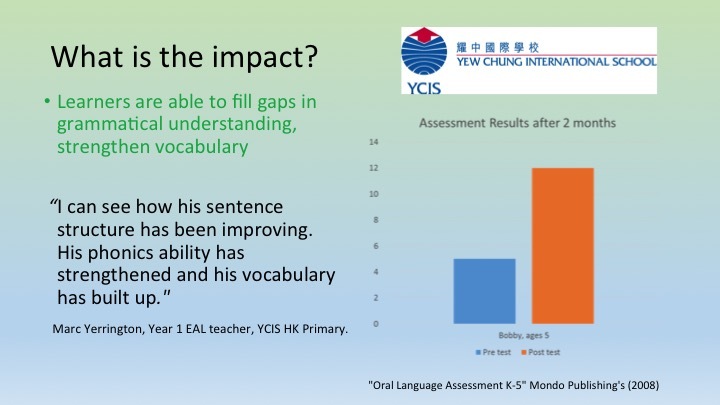 She has also developed EAL teacher training, resources and online learning (https://www.learningvillage.net) to support teachers catering for new-to-English learners in the English speaking mainstream. Simon joined the Across Cultures team to work collaboratively in developing our online EAL learning environment, the Learning Village. Simon has over 10 years experience as a programmer and has a keen interest in languages, having also taught English as a Foreign Language in the past. Simon runs CDU Digital, a website development and digital marketing business. Beverley is often the first person you'll speak to if you register on the Learning Village. She'll help with all your initial questions and set you up with your Learning Village advisor who can provide you with initial training and ongoing support. Beverley lives near Manchester with her dog, Poppy, and is the proud mother of Jasmine, who has just started university. Sobia liaises with teachers as well as manages venue arrangements for our courses. She also supports the development of content on the Learning Village... among other things! Sobia works as a Teaching Assistant part time and is a qualified programmer! She has a 7 year old daughter who is in-love with the Communication Across Cultures cat! Heidi has joined Across Cultures in June 2018. She deals with all day-to-day administrative tasks, our newsletters and content production. She is also responsible for our social media channels and all things Marketing. Already speaking three languages fluently, she has a lot of experience in language learning. Alongside working for Across Cultures, she is also currently studying towards her Business and Management degree. Caroline Scott, Author and Director at Across Cultures originally began writing an induction to English, funding by the Local Authority of Tower Hamlets in 2002. This funded was awarded to accommodate for the distinct need for additional support for new-to-English learners in the mainstream. After writing her first draft, Caroline went on to develop this further, eventually providing training for many schools in Tower Hamlet sand beyond. Caroline eventually left Tower Hamlets to start an international School overseas. There, she was able to develop ideas further and, with significant additional research, she wrote her first book, 'Teaching Children as an Additional Language: A Programme for 7-11 year olds.' She later went onto write her second book, 'Teaching English as an Additional Language 5-11, A Whole School Resource' which encompassed many more facets of language learning including language learning strategies, additional assessment and differentiating further for all levels of language across all curriculum subjects. The Learning Village was a natural evolution of her work. It allows increased flexibility for learners and teachers as well as significantly more content and assessment opportunities. 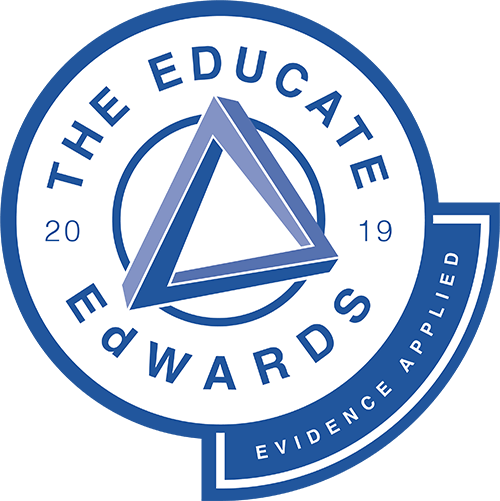 Caroline also delivers a three day training for senior teachers/leaders on supporting EAL learning across the curriculum (the EAL 'Train the Trainer' course) as well as whole school insets and one day courses on how to achieve effective EAL teaching through the Learning Village. I've lost my username/password, what can I do? 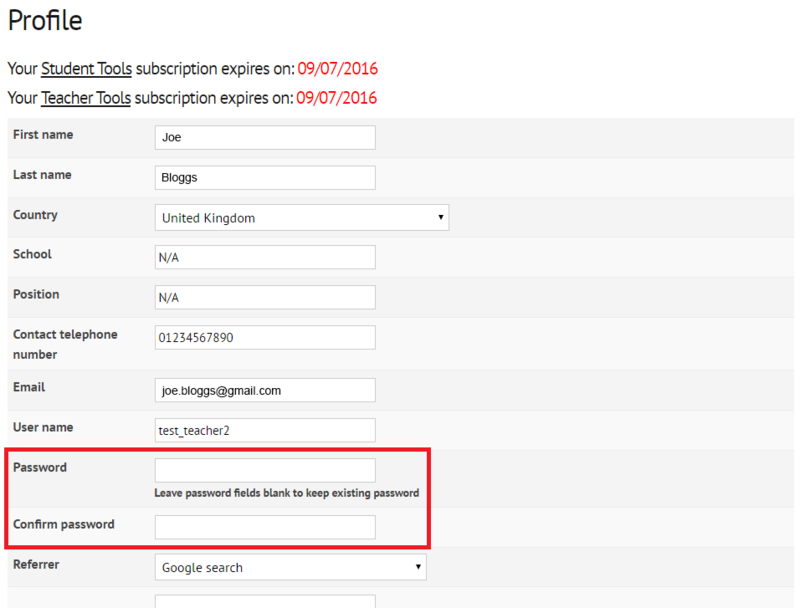 You can then click on the link to log in without a password.